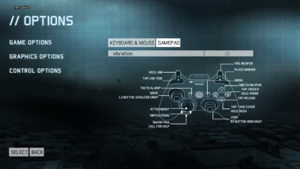 Game has issues remembering remapped keys. Game has severe issues connecting to friends for co-op campaign. Settings can only be accessed via the main menu. Deluxe Edition is also available. The latest non-Steam patch is Title Update 1.8 which can be installed through the launcher or downloaded manually from Ubisoft's servers. The Steam version is already patched. If the games is purchased as a retail DVD, is most likely version 1.0. In this case, all the update patches have to be applied one by one. The official Ubisoft link to the updates is here. Requires Title Update 1.4 or newer; install Title Update 1.8. 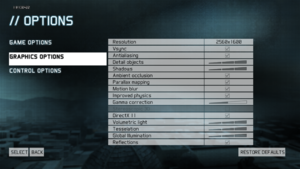 Must edit config file, and cannot change resolution in-game. Window is always on top, blocking other windows. 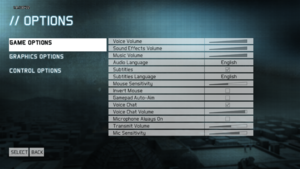 Title Update 1.2 will lock the resolution to 720p. This fix resolves a lot of video resolution problems and enables the game to be played in most resolutions and in Eyefinity setups. Bindings may not be remembered. Drone movement and zoom controls permanently bound to WASD and spacebar. 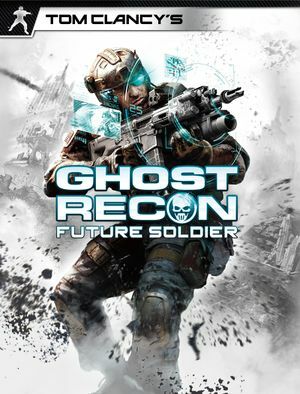 Anytime you connect to a host with a different patch, you will be booted within 10–15 seconds of connecting because the Steam version is different to other multiplayer hosts or clients. Check that no other network adapters are enabled. Adapters such as VPN, VirtualBox, and others may cause conflict. In the event that multiple are present, disable all but the one your intend to use. Alternatively, change the priority for the network adapter. Use Google's DNS servers (8.8.8.8 and 8.8.4.4, as found here). 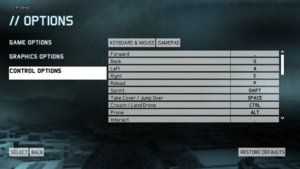 Keyboard and mouse may be selectable within the game menu but do not work in-game. Save, then set the file to read only. Save, then then set the file to read only. Due to poor optimization, the effect is extraordinarily resource-intensive. Because of poor optimization of graphics, enabling this should reduce movement/camera lag in-game. The game may force your monitor's refresh rate to 60 hz. This results in reduced smoothness on high refresh rate monitors, and will limit FPS to 60 if Vsync is enabled. Open dxgi.ini in the installation folder. If your monitor has a manual refresh rate toggle button, you can use that to set a higher refresh rate instead of using a custom .dll. ↑ 1.0 1.1 File/folder structure within this directory reflects the path(s) listed for Windows and/or Steam game data (use Wine regedit to access Windows registry paths). Games with Steam Cloud support may store data in ~/.steam/steam/userdata/<user-id>/212630/ in addition to or instead of this directory. The app ID (212630) may differ in some cases. Treat backslashes as forward slashes. See the glossary page for details. This page was last edited on 16 April 2019, at 21:39.